My last post mentioned my schedule at WWWC 7. This is my first time to actually go to this con. To those outside of Arizona this may be of little interest. The con is held at Old Tucson Studios. Back in the day, they filmed a lot of movies and TV shows there. I'm sure a company could film something today, but the place is now a tourist park. It has the same locations where they filmed Gunsmoke and High Chaparral. They've added some rides and you can drive old timey cars and take the train around the park. I have been to the park, but not to WWWC. It's an interesting place to hold a steampunk convention. In October the place opens at night and becomes a haunted western town. That version is called Nightfall and I haven't been to that yet, either. Most cons are held in hotels, as hotels have meeting rooms and they'll often give you rooms based on how many hotel rooms you can fill. That's the common formula. Having the convention at the Old Tucson site is a very different environment. They're using the Saloon for the concerts. Smaller activities like my presentations are being held in the sheriff's office and a few similar buildings in the park. There's a barn the dealers are in. And it really works out for me, as I am only ten minutes away from the park. There is a convention hotel for folks coming in from out of town.. Alas there aren't any hotels near Old Tucson and people staying at the convention hotel are over by the airport--some distance away. 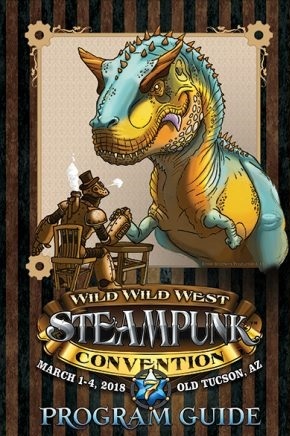 Finally, they put out the schedule for Wild Wild West Con. It's next weekend. Lots of great stuff going on. In terms of me personally, I'm giving three presentations--all are at the Sheriff's Office. Friday I'm talking about one of my favorite subjects--cover art. On Saturday I'm talking about what's new in Weird Western books. On Sunday I'm talking about the Great 1897 Airship. Should be a fun weekend. I'm looking forward to it. Hadrosaur Productions will be selling some of my books at the Vendor Barn. I have not watched a single minute of the Winter Olympics. I just can't make myself care. I sure wish those people would go and stay at haunted hotels. Now there is something that interests me. I would watch if they'd bring a Yeti in and have it perform ice skating or something. That would be something. The format now--boring. I got my federal income tax refund in nine days. That's not bad. Good job IRS. I'm impressed. Yesterday I had to sit at the tire store for an hour and a half to get a flat tire repaired because it had a nail in it. The store was busy and I had to wait. It seems like car work requires a lengthy wait in these parts. It won't be too much longer and the snowbirds will start leaving. Then the college kids will disappear for the summer. Tucson is a lot nicer then. The streets are empty. And it's not so hard to get appointments to fix your car or your plumbing. It's 110 degrees, but at least you can get stuff done. Yay! Almost there. Actually, it's about two months. Hey buckaroos, a new book is out that I'd like to mention. 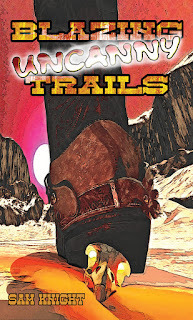 Sam Knight has a new collection called Blazing Uncanny Trails. It's got lizard men--at least one of the stories does anyway. In the interest of disclosure, I acted as original publisher or editor in four of the stories in this book. That said, Sam Knight is a prolific Colorado author who writes across genre lines. 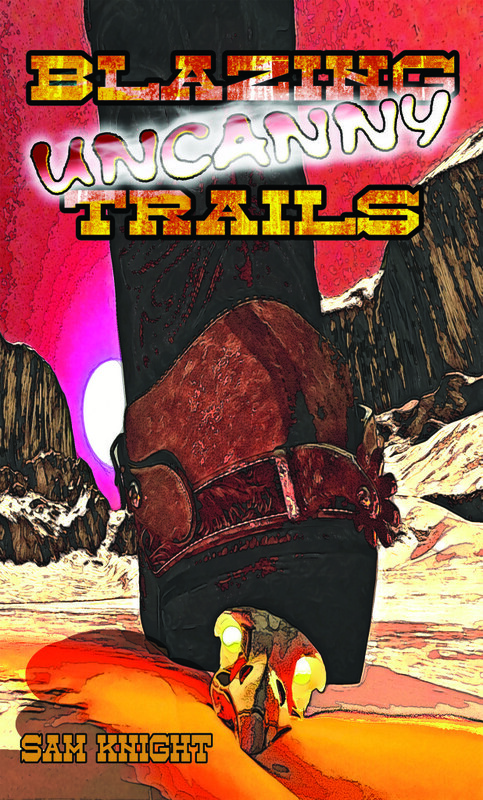 He's one of a small group of Rocky Mountain authors who cranks out weird western stories from time. And that's what these are. The dedication page says it better than I could: For my grandfather, who loves Westerns but really dislikes the supernatural crap. Except for the lizard man. These are superb stories. The book is available in ebook, paperback and hardcover. I was surprised to see a hardcover. This is physically a nice book, It has a nice cover and is well laid out. . The lead off story "Working the Salt Mine" is my favorite. I originally published it in Science Fiction Trails magazine. And it's the one with the lizard man. It's a really neat story. I enthusiastically recommend getting this book. Maybe the local library will buy it for you to read. Ask them. Sam Knight is as good as it gets in the world of weird westerns. I remember when lottery scratch tickets were a dollar. Things sure have changed. Yesterday I thought I'd buy one. A lot of them were in the 10, 20 & even $30 price range. Yipes. I picked one that was ten bucks and scratched it off. I won absolutely nothing. That's it for the year. I average one lottery ticket per year. Three weeks ago a Chinese fortune cookie promised me I was coming into a fortune. I thought I'd help speed things along. Apparently not. It's been recently pointed out that I don't really seem to like any holiday but Ground Hog Day. It's hard to get behind this particular holiday with Donnie in the office. The man is a disgrace, running the most inept and corrupt administration in the history of the republic. I try and keep this blog non political. But it's not called Rants & Raves for nothing. Saw one of those robo cars being tested the other day. It had that distinctive rotating thing on top. Plus it said test car on it. I was so so tempted to mess with it. Get in front of it and slam on the brakes. Get behind it and tailgate it. Get beside it and crowd it. But I didn't. I don't care about that sort of stuff. I want to know about other things. There are plenty of unanswered questions I have. First, how does it know if a police car is trying to stop it? Can it identify a flagman? If some joker replaced the 45 mph sign with a 90 mph sign, would it take off and go 90? What does it do if someone's shooting at it? If someone's shooting at me, I'm getting the heck out of there. What if it just stops and turns on its flashers? Turning on flashers solves everything. If a draw bridge is up, will it stop or drive you right into a river? If something like Bigfoot is standing in the road, what will it do? Can it drive through Jack in the Box and get you tacos, or will it just drive pas the pickup window and resume its course? These are the kinds of things I want to know. Happy New Year! Today is Chinese New Year. Yay! As we usher in the Year of the Dog I find myself waxing nostalgic a bit. I was born in the Year of the Dog, so it's a special year in the zodiac rotation of the Chinese or Lunar system. Danm, I am getting old. Years of the Dog have been good to me, overall. So, have some won ton in celebration. 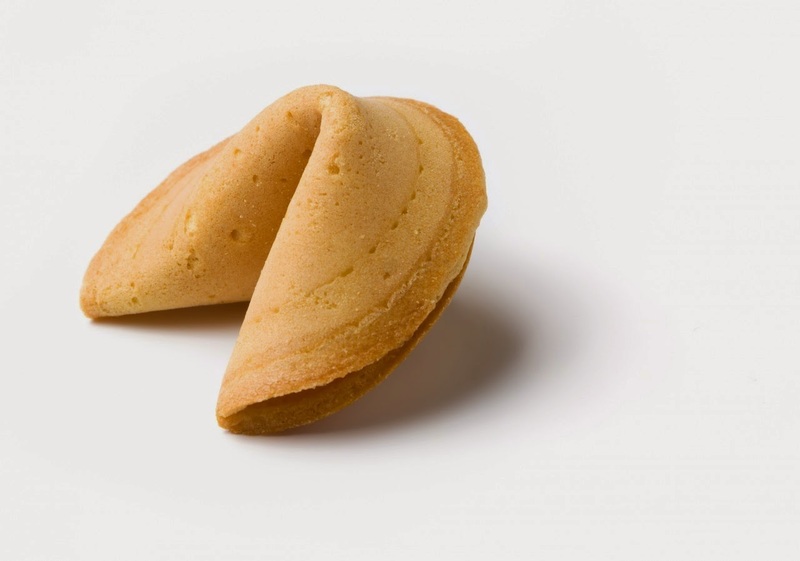 Have a fortune cookie. And maybe a glass of Tsingtao or another Chinese beer. Speaking of fortune cookies, I got one three weeks ago saying I was coming in to a fortune. Well, I'm still waiting fortune cookie company prophets. 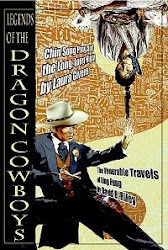 And last but not least, to mark your celebration, read Legends of the Dragon Cowboys by myself and Laura Givens. That's two novellas set in the Wild West era. You can download it on Kindle right this minute. We've had a nice gentle rain the last two days--the first moisture in months. That's the Sonoran desert for you. I don't know how our plant friends survive here between the heat and the long periods with no rain. Somehow, they do. What if you don't know nothin? They say writers should write what they know. What if they don't know anything? Well, that doesn't seem to stop them. Yesterday I lamented the lack of adherence to our writers guidelines for Hotel Haunted, the ghost anthology. The situation at Science Fiction Trails is quite different. Most of the stories I get do, technically, comply with the guidelines. But they're just crap. They're often just some walking badge of a sheriff or generic Indians. Most of the characters are just titles and they don't even bother to give that character a name. If a writer doesn't even care enough about a character to give him a name, why should I care? Answer: I don't. Sure, it's not as easy to write about the 1800s as it is modern times. But it's not that hard. I said I was particularly looking for robot stories. Thus far I've gotten one. Used to get a lot of professor/inventor type stories. Now, I hardly ever see them. Aliens in a cave for some inexplicable reason--those I still get. I knew we lost some momentum after coming back from the grave after I cancelled SFT. But the drop in quality of stories is simply astonishing. And I really do not know why. I just finished reading for a ghost story anthology. As usual, the overwhelming reason stories were rejected was they didn't comply with our writers guidelines. I'm never really sure if the writers sending these stories in don't bother to read the guidelines or simply do not care. But, a story where you need a haunted hotel shouldn't be getting stuff with people wandering around in outer space, or struggling with haunted cars--but we did. And this is consistent with other books I've done. If you take away those stories that do not meet the writers guidelines we put out, almost every one that did comply was accepted. Now, that's not an automatic template to success. Some writers guidelines are so vague you can't really tell what a project actually wants. But, if they say it needs to take place at a haunted hotel--put the story in a haunted hotel. If a story is supposed to take place during the 1800s, don't be all that shocked that your World War II story is being rejected. Seriously. It is simply astonishing how often this happens. Well, I just voted on the Stoker Awards. They're the awards the HWA gives out for the best dark fiction each year. It's all well and good, as far the voting part. I get tired of being pestered all year long by people who think I should vote for their book or anthology or short story. Frankly, a lot of these people are delusional if they think their mediocre story is going to win something. I hate text messages. I really hate them. It seems like every place I do business with has suddenly taken it upon themselves to text me. So,in disgust, I called my service provider and said I don't want text messages. Well, the jabbering idiot in the Indian call center kept telling me that text messages were included and it didn't cost extra. I know it's included. I don't want the damned hardware store to send me a text that they have light bulbs on sale. So I hung up and then got a text message tanking me for my call and hoping I am satisfied. I ain't satisfied. I'd like to text the mangers of the phone company who provide my horrible service and tell them what I'd like to do to them, but that would get me in trouble. It is no wonder people go off the grid. Explain Valentines Day to an alien from Mars. 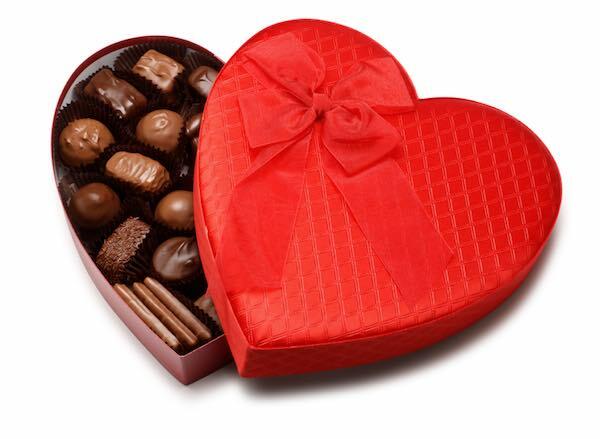 Well, if you have someone you love, you give that person gifts to demonstrate your affection. So, this lawn mower on sale at Sears would be given to your mate? Not exactly. Only certain presents. Mainly jewelry to females and men get a card. They might like a new lawnmower, but it's not allowed. And you have to cook her something or take her to a restaurant. But Walgreen's has Valentine candy on sale. Not allowed. They trick men into giving women candy. It is a bad thing. The females will react badly and claim candy makes her fat. What about these dead flowers at this store? Women love dead flowers as long as they're red roses. So, if a men arrived with a lawn mower and candy, what would happen? How unfortunate. This is a baffling custom. Well, I've been editing an anthology along with author Julie Campbell called Hotel Haunted, which is a project for Wolfsinger Publications. It was interesting to see what other people came up with in the way of ghost stories. It's been a long held belief of mine that Americans do not care for ghost stories much. Zombies, for example, always seem to be more popular. So do vampires. I prefer ghost stories. They're my favorite type of horror tale. I like to do what interests me and that's why it's ghost stories. Even though I convinced myself they aren't as popular, my anthology Gunslingers & Ghost Stories is the best selling anthology I have edited to date. Back in October I met with Wolfsinger publisher Carol Hightshoe at Mile Hi Con and made a deal with her for me to edit an anthology. 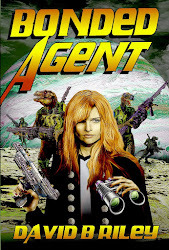 I've had a few stories in their anthologies and they are the publisher of my science fiction novel, Bonded Agent. Next came the reading and selection phase. Co-editor Julie Campbell and I did not disagree on a single story. There were yes stories and no stories and we had no disagreements. We did have two stories we wanted minor re-writes to. All in all it was a smooth process. Once the re-writes come back, we'll ship off the material to the publisher. Some creepy stuff in this one, but that's a good thing for a horror anthology. And that's how you make an anthology. Anthologies rarely sell as well as novels. I'm not sure why. They're a good way to read new authors you might not be aware of. When a release date is announced I'll post ordering info so anyone can order a copy who might want one. I just hope it's on the market before Halloween. That's one time of year when folks are very receptive to ghost stories. As I've said many times, I worked at a hotel in Vail, Colorado for a number of years. And most of that was on the night shift. Hotels have meetings for various groups. I recall there was one meeting going on with some local media and what not. Anyway, I was working a rare evening shift and not the night shift, which meant checking in guests. So I checked in this man, who was with three other guys. And I said "if you need anything let me know." I often said that or something similar. "Well, can you get me a date with Lindsey Vonn" [a famous local skier]. He said. "You'll have to ask her yourself, sir," was my immediate response. "She's standing right behind you." I actually was not sure, but a woman who sure looked like her had come into the lobby as this group was breaking up. I have never actually met her. And this guy sure as hell hadn't, either. The poor guy had no idea what to do. He slowly turned and accepted the premise it was her. "Well, go ask her out," one of his buddies said. "No, she's not," his buddy pointed out. ":Look, she's leaving." He sounded very relieved. And they all went off to their room. That was about how I figured it would turn out. It would've really been something if he'd gone over to her and it really was the famous skier and he actually got a date with her. That didn't happen. He should've taken a notepad off the front desk and gone over and gotten her autograph, then told his buddies she gave him her phone number. I don't think he thought of that. Alexa, find me a prostitute. I want a pretty one, not one like the last time. Veronica will be by at 7 pm. Not her again. Get me a redhead. April will be by at 7 pm. She only takes cash. Alexa, did the guy the dog bit pull through? No. He died yesterday. His family has hired a lawyer to sue you. Do you want me to send flowers to the funeral? Alexa, call work and tell them there is a bomb in the building. Can't you just call in sick? I'm running late. This way they won't notice. I told them they'll all die and the bomb will go off in ten minutes. Alexa, where are my car keys? They're in your pocket where they always are. Alexa, cancel Mike's credit cards. Which Mike? Your boss or your brother? Just do both of them. Oh, almost forgot, Alexa cancel Gwen's honeymoon reservations in Jamaica. Gwen your ex-girlfriend or Gwen the waitress you're hot for at the diner? Gwen my ex-girlfriend. How do you know about Gwen at the diner? It's sad really. I've been working on my ghost story anthology. The bad stories were extra bad this time around. I've edited anthologies many times over a very long period of time. It just amazes me how bad the story submissions keep getting. It seems every new project, the bad stories just get worse. It's no longer just poor writing or a moronic plot. Now it's people who do not have a basic command of the English language. It's like most of the writers are third graders. Basic concepts like a paragraph elude them. They've certainly never looked at a writing book and seen a model manuscript. Nope. Unbridled gibberish seems to be the norm. I guess they don't bother to teach basic composition in school any longer. Oh there some good stories out there and there are still people who know how to write. They just seem to be dwindling in number. Well, once again it is Ground Hog Day. Once again I am trying to convince people to eat sausage. Sausage? Yes, sausage is ground hog. What else would you eat on Ground Hog Day? 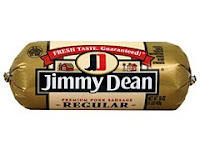 Heck, in years past I've even written Jimmy Dean [the sausage company not the dead entertainer]. They seemed to think I was some sort of kook. It makes more sense than some weather prediction. I'm sure Phil would like to have a nice plate of sausage. So, dear reader, go forth and acquire some sausage and eat it today. And that's how we celebrate Ground Hog Day. Well, yesterday there was supposed to be this big honking moon. And it also came with some sort of eclipse. I wouldn't know. I was too busy trying to sleep. Emphasis trying to sleep. The full moon seemed to really fire up the coyotes. They were standing in my back yard howling away at the moon, having a good old time. Boy howdy was I glad when that stopped. Although, I was tempted to go outside and howl with them. Back a few years ago my parents had a golden retriever. Sometimes I'd dog sit him if they were going somewhere. So I'd take him on his walk and the local coyotes would sometimes start howling. I'd answer them back. I don't know if they thought I was another coyote or they thought I was some dude howling, but they'd answer back. Now Zeto, the dog, could hear all this and he would get really upset. "You're scaring me Dave. Stop howling Dave. Seriously, stop howling." But I would just ignore him. The coyotes would usually stop first. Then I'd give up. So, when I say I was tempted to go out and howl with the coyotes, I really mean it. I just didn't want to put my shoes on or I would have. Plus it was kind of chilly last night. Howling at the moon. Haven't done that in years. Might've been fun.